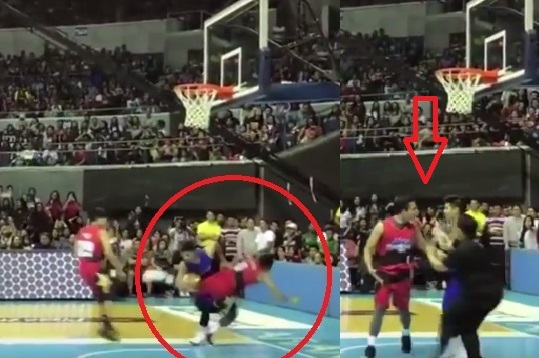 It was an intense battle between Team Daniel and Team Gerald at the Star Magic All-Star Basketball game held yesterday, August 13, at the Smart Araneta Coliseum. In the third quarter of the game, Daniel and JC got heated after the former accidentally stumbled when they both tried to keep the possession of the ball. Although it has gotten heated, the two immediately settled the matter. In an interview with ABS-CBN News, JC said he's sorry after what happened, admitting also that he didn't know how intense the game was. "Nag-sorry ako. Sabi ko, 'Sorry bro, tumaas lang emotions ko.' After the game, nag-sorry ulit ako. Sabi ko pasensya na, hindi ko alam na ganito ka-intense"
Daniel, on the other hand, said that it was understandable because all of them wanted to win. "Ako din nag-sorry ako [kay JC] kasi uminit din ako. Siyempre gusto niyo lahat manalo so hindi mawawala 'yung competitiveness ng lahat. Pero okay lang kami, no problem "
Team Gerald won against Team Daniel by a score of 93-90. The Star Magic All Star Game will be aired on August 20 on ABS-CBN after 'ASAP' and on Sports and Action at 8 p.m.